Dnipro hotel is situated in the centre of Kiev, which gives the opportunity to get to the government and cultural establishment and the architectural monuments of the ancient city in minutes. The hotel is 60 km from the State International Boryspil Airport, 14 km from the Municipal Kiev airport, the central railway station of Kiev is located 5 kilometres from the hotel. Hotel offers 192 rooms, including 40 suites, divided into 10 categories. Non smoking rooms and suites are available but subjected to confirmation in advance. The hotel offers standard and superior rooms. Single standard rooms are equipped with direct dial telephone, internet access, satellite TV, hairdryer and bath room (shower). Available with single bed only. 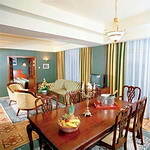 Twin standard rooms have direct dial telephone, internet access, satellite TV, and bath room (bath tube) and hairdryer. Available with twin beds only. Junior and Senior suites standard are equipped with living and bed rooms, direct dial telephone, internet access, satellite TV, bathroom(bath tube), air-conditioned, hairdryer, mini-bar. Available with twin beds only. Executive suite standard is available with double bed. All superior rooms are available with single, double and twin beds.